رجب پور, رسول, طالب بیدختی, ناصر, رخشنده رو, غلامرضا. (1395). ارائه الگوریتم‌ جدید G-JPSO و توسعه آن در کنترل بهینه پمپ‌ها در شبکه توزیع آب. مجله آب و فاضلاب, 27(6), 3-14. رسول رجب پور; ناصر طالب بیدختی; غلامرضا رخشنده رو. "ارائه الگوریتم‌ جدید G-JPSO و توسعه آن در کنترل بهینه پمپ‌ها در شبکه توزیع آب". مجله آب و فاضلاب, 27, 6, 1395, 3-14. رجب پور, رسول, طالب بیدختی, ناصر, رخشنده رو, غلامرضا. (1395). 'ارائه الگوریتم‌ جدید G-JPSO و توسعه آن در کنترل بهینه پمپ‌ها در شبکه توزیع آب', مجله آب و فاضلاب, 27(6), pp. 3-14. رجب پور, رسول, طالب بیدختی, ناصر, رخشنده رو, غلامرضا. ارائه الگوریتم‌ جدید G-JPSO و توسعه آن در کنترل بهینه پمپ‌ها در شبکه توزیع آب. 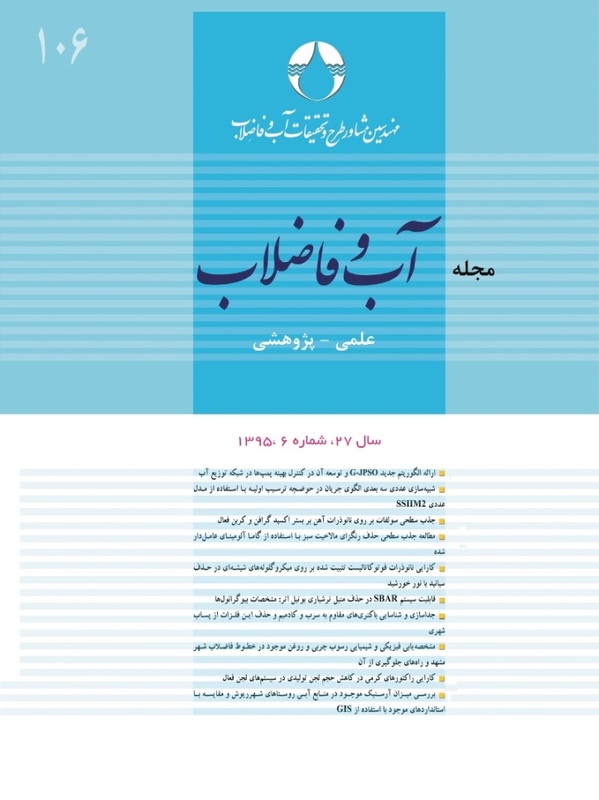 مجله آب و فاضلاب, 1395; 27(6): 3-14. اخیراً از روش‌های فراکاوشی به‌عنوان ابزاری کارآمد برای حل مسائل پیچیده مهندسی استفاده زیادی شده است. یکی از این روش‌ها الگوریتم JPSO است. در این پژوهش با اعمال تغییراتی ابتکاری در ماهیت پرش این الگوریتم، امکان حل مسائل مبتنی بر ساخت گراف در آن فراهم شد و الگوریتم جدیدی به نامG-JPSO ارائه شد. در این پژوهش کاربرد الگوریتم جدید توسعه داده شده در حل تابع فلتچر-پاول و مسئله کنترل بهینه پمپ‌ها در شبکه توزیع آب مورد بررسی و ارزیابی قرار گرفت. کنترل بهینه پمپ‌ها شامل برنامه زمانی مناسب بهره‌برداری از قبیل تعیین وضعیت روشن و خاموشی هر یک از پمپ‌ها در بازه زمانی مورد نظر بود، به نحوی که علاوه بر کاهش هزینه برق مصرفی نیاز گره‌های مصرف و محدودیت‌های مسئله شامل حداقل فشار مورد نیاز در هر گره، حداقل و حداکثر ارتفاع مخازن و غیره مرتفع شود. در این پژوهش محدودیت دیگری شامل حداکثر تعداد روشن و خاموش کردن هر پمپ نیز به تابع هدف اعمال شد. برای تعیین برنامه بهره‌برداری بهینه پمپ‌ها یک مدل بهینه‌سازی-شبیه‌سازی مبتنی بر الگوریتم بهینه‌سازی G-JPSO و JPSO تهیه شد. از مدل پیشنهادی برای تعیین برنامه‌ بهینه بهره‌برداری شبکه توزیع ون زیل استفاده شد. مقایسه نتایج این الگوریتم در مسائل پیشنهادی با نتایج الگوریتم‌های جامعه مورچگان، ژنتیک و JPSO نشان‌دهنده توانایی بالای الگوریتم ارائه شده در پیدا کردن جواب‌هایی نزدیک به جواب بهینه با صرف هزینه محاسباتی مناسب است. Recent decades have witnessed growing applications of metaheuristic techniques as efficient tools for solving complex engineering problems. One such method is the JPSO algorithm. In this study, innovative modifications were made in the nature of the jump algorithm JPSO to make it capable of coping with graph-based solutions, which led to the development of a new algorithm called ‘G-JPSO’. The new algorithm was then used to solve the Fletcher-Powell optimal control problem and its application to optimal control of pumps in water distribution networks was evaluated. Optimal control of pumps consists in an optimum operation timetable (on and off) for each of the pumps at the desired time interval. Maximum number of on and off positions for each pump was introduced into the objective function as a constraint such that not only would power consumption at each node be reduced but such problem requirements as the minimum pressure required at each node and minimum/maximum storage tank heights would be met. To determine the optimal operation of pumps, a model-based optimization-simulation algorithm was developed based on G-JPSO and JPSO algorithms. The model proposed by van Zyl was used to determine the optimal operation of the distribution network. Finally, the results obtained from the proposed algorithm were compared with those obtained from ant colony, genetic, and JPSO algorithms to show the robustness of the proposed algorithm in finding near-optimum solutions at reasonable computation costs. 1. Yeniay, O. (2005). “A comparative study on optimization methods for the constrained nonlinear programming problems.” Mathematical Problems in Engineering, 2, 165-173. 2. Lee, K. S., Geem Z.W., Lee S. H., Bae K. W. (2005). The harmony search heuristic algorithm for discrete structural optimization.” Eng. Optim., 37, 663-684. 3. Afshar, M.H., and Rajabpour, R. (2009). “Application of local and global particle swarm optimization algorithms to optimal design and operation of irrigation pumping systems.” J. of Irrig. and Drain. Eng., 58(3), 321-331. 4. Mackle, G., Savic., D. A. and Walters, G. A. (1995). “Application of genetic algorithms to pump scheduling for water supply.” Institute of Electrical Engineers Conference Publication, 4(4), 400-405. 5. Rodin, S. I., and Moradi-Jalal, M. (2002). “Use of genetic algorithm in optimization of irrigation pumping stations.” <http://stullia.t-k.ru/waterpump/waterpump.htm>. (June 10, 2002). 6. Moradi-Jalal, M., Marino, M. A., and Afshar, A. (2003). “Optimal design and operation of irrigation pumping station.” J. Irrig. Drain. Eng. 129(3), 149-154. 7. Rajabpour, R., and Afshar, M. H. (1387). “Optimized operation of serial pump stations using the PSO algorithm.” Journal of Water and Wastewater, Vol.19 No.2 (66), 56-66. 8. van Zyl, J. E., Savic, D. A., and Walters, G. A. (2004). “Operational optimization of water distribution systems using a hybrid genetic algorithm.” J. Water Resour. Plann. Manage., 130(2), 160-170. 9. López-Ibáñez, M., Prasad, T. D., and Paechter, B. (2008). “Ant colony optimization for optimal control of pumps in water distribution networks.” J. Water Resour. Plann. Manage., 134(4), 337-346. 10. Bozorg Haddad, O., and Marino, M. A. (2007). “Dynamic penalty function as a strategy in solving water resources combinatorial optimization problems with honey-bee mating optimization (HBMO) algorithm.” Journal of Hydroinformatics, 9 (3), 233-250. 11. Sanda-Carmen, Radu P., and Andrei M. (2010). “Pumping stations scheduing for a water supply system with multiple tanks.” U.P.B. Sci. Bull., Series D, 72 (3), 129-140. 12. Rasoulzadeh Gharibdosti., S., and Bozorg Hadad., O. (2012). “Development and application of NLP-GA hybrid algorithm to optimize the design and operation of pumping stations.” Iranian Journal of Soil and Water Research., 43(2), 129-137. 13. Hashemi, S. S., Tabesh, M., and Ataee Kia, B. (2011). “Ant-colony optimization of energy cost in water distribution systems using variable speed pumps.” Proceedings of 4th ASCE-EWRI International Perspective on Water Resources and The Environment, National University of Singapore, Singapore. 14. Hashemi, S. S., Tabesh, M., and Ataee Kia, B. (2012). “Scheduling and operating costs in water distribution networks.” Water Management, 166(8), 432-442. 16. Hashemi, S. S., Tabesh, M., and Ataee Kia, B. (2014). “Ant-colony optimization of pumping schedule to minimize the energy cost using variable-speed pumps in water distribution networks.” Urban Water Journal., 11(5), 335-347. 17. Abdelmeguid, H., and Ulanicki, B. (2010). “Feedback rules for operation of pumps in a water supply system considering electricity tariﬀs.” Water Distribution Systems Analysis, doi:10.1061/41203 (425)(08). 18. Skworcow, P., Ulanicki, B., AbdelMeguid, H., and Paluszczyszyn, D. (2010). “Model predictive control for energy and leakage management in water distribution systems.” UKACC International Conference on Control, Coventry, UK. 19. Fiorelli, D., Schutz, G., Metla, N., and Meyers, J. (2012). “Application of an optimal predictive controller for a small water distribution network in luxembourg.” Journal of Hydroinformatics, doi:10.2166/hydro.2012.117. 20. Paluszczyszyn, D., Skworcow, P., and Ulanicki, B. (2013). “Online simpliﬁcation of water distribution network models for optimal scheduling.” Journal of Hydroinformatics, doi:10.2166/hydro.2012.029. 21. Kennedy, J., and Eberhart, R. (1997). “Adiscrete binary version of the particle swarm algorithm.” IEEE Conference on Systems, Man, and Cybernerics, 5, 4104-4108. 23. Al-kazemi, B., and Mohan, C. K. (2002). “Multi-phase discrete particle swarm optimization.” Fourth International Workshop on Frontiers in Evolutionary Algorithms, Kinsale, Ireland. 24. Moreno-Perez, J. A., Castro-Gutierrez, J. P, Martinez-Garcia F. J., Melian, B., Moreno-Vega, J. M., and Ramos, J. (2007). “Discrete particle swarm optimization for the p-median problem.” Procceedings of the 7th Metaheuristics International Conference, Montreal, Canada. 26. Gen, M., and Cheng, R. W. (1997). Genetic algorithm and engineering design, John Wiley and Sons, Inc., N.Y.
27. Jalali, M. R., and Afshar, A. (2005). “Optimum design and operation of hydrosystem by ant colony optimization algorithm; A new metaheuristic approach.” PhD Disseration of Water Engineering, Iran University of Science and Technology, Tehran. 28. Lansey, K. E., and Awumah, K. (1994). “Optimal pump operations considering pump switches.” J. Water Resour. Plann. Manage., 120(1), 17-35. 29. Atkinson, R., van Zyl, J. E., Walters, G. A., and Savic, D. A. (2000). “Genetic algorithm optimization of level-controlled pumping station operation.” Proc. Water Network Modelling for Optimal Design and Management, Centre for Water Systems, Exeter, U.K., 79-90.